LG didn't announce it officially yet, but the 55EA9800 55" curved OLED TV just arrived on Amazon.com, with a price tag of $9,999. That's a sharp price drop from $14,999 - but it was expected after LG's OLED TV price cut in Korea. Amazon says the TV is currently unavailable, but hopefully they'll stock it soon. You can already order it and they'll ship it when available. Up until now the EA9800 was only available via BestBuy, but it seems Best Buy's exclusive sale period is soon over. LG's 55" curved OLED TV is still more expensive than Samsung's curved OLED, the KN55S9C, which costs $8,999 (and is now shipping from Amazon). Reviews of both OLED TVs are raving, and HDGuru says both TVs are the best TVs they ever tested, with Samsung's OLED outperforming LG's. 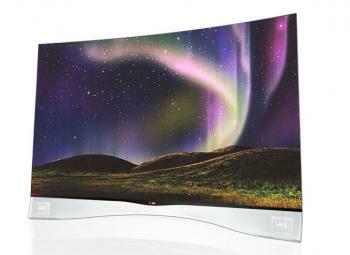 LG's EA9800 is a 55" curved OLED TV, featuring an Oxide-TFT WRGB Full-HD OLED panel. The TV features "infinite" contrast ratio, passive 3D, Smart Touch Controls and a "paper-slim" design. It is made from Carbon Fiber-Reinforced Plastic (CFRP) and weighs just 17 Kg and is only 4.3 mm thick. The curved screen "removes any hint of visual distraction to maximize the viewing experience". 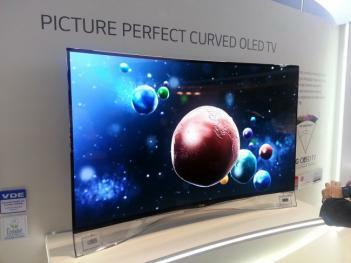 Reviewed.com is giving away one LG EA9800 curved OLED TV in a new giveaway!